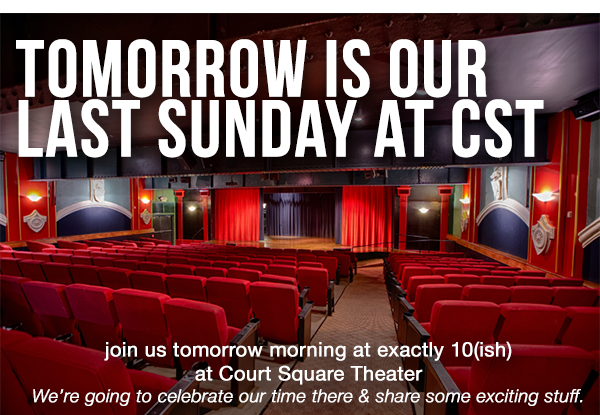 Tomorrow (January 10) will be our last Sunday holding worship at Court Square Theater. We hope this service will gives folks a chance to remember all of the fantastic and transformational times we’ve had in that space. From the missional works of packaging a few thousand diapers to those in need to the summers where the brave people within our community stood on that stage and shared their stories with us for a chance of “me too” to the awkward transitions, firefighters storming in mid service, left shark with “Katy Perry” to the awesome leaders we’ve seen come and go and grow and all the other corky things the RISE community experiences. BUT. don’t be too sad because we also have some very exciting news for the future! Head on over to our we’re moving! page to see more. Ps: after this Sunday we’ll still be holding worship of course! it’ll just be at Memorial Hall (across from Greenberry’s Cafe on 42) about a 5 minute drive from Court Square Theater.